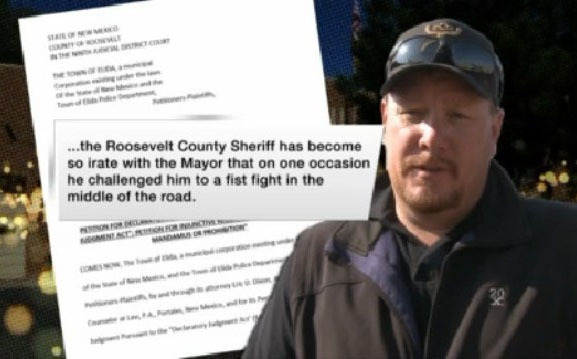 Did a New Mexico sheriff challenge a New Mexico mayor to a fist fight in the middle of a street? That claim is part of a strange lawsuit. The tiny village of Elida is dealing with some pretty big drama because of it. Mayor Durward Dixon says Roosevelt County Sheriff Malin Parker overstepped his authority on a call made to Elida police about a dog killing chickens. “The sheriff showed up and said he could not take the dog and gave the dog back to the owner despite the fact that it had killed livestock,” said Eric Dixon, Durward Dixon’s attorney. The lawsuit states Sheriff Parker refused to talk to the mayor about the issue and that the sheriff then got so irate that he challenged the mayor to a fist fight in the middle of the road. “We’re just asking that the sheriff abide by the law and assist Elida in the enforcement of state law and its ordinances,” said Dixon.